With a daunting project completed, the Sun City Resident Action Program is moving on. SCRAP, a 50(c)(3) organization, was created initially by the Sun City Home Owners Association and then separated from SCHOA for the express purpose of addressing the need to repair and paint the community’s common walls, according to Jim Hunter, SCHOA board president. The effort was originally estimated to be a 10-year project to cost $25,000 per year. Cameron Arnett painting a Sun City wall. But all exterior common walls were painted in just short of three years and the final cost was $157,000, according to Lloyd Maple, SCRAP board chairman. “That included the 1.5 miles of unpainted wall on the north side of Olive Avenue between 99th and 111th avenues that was not in the original plans,” he stated in an email. The effort was completed sooner and under budget because of the hard work of the committee, particularly Mr. Maple, according to Ritchie Miller, SCRAP treasurer. “Lloyd worked diligently to get the best prices on paint and supplies and we found a reliable, quality painting company, Artistic Painting Company, to do the majority of the work,” he said. That was in addition to the contribution of all of the volunteers who helped prepare and paint large pieces of walls, he added. With that project complete, SCRAP will undergo some changes. The organization will be renamed the SCHOA Foundation. The panel will continue to accumulate funds for when the walls need painting again, but it will also take in a SCHOA program — the Residents Assistance and Maintenance Program — that seems to fit its mission, according to Mr. Hunter. Since SCRAP/SCHOA Foundation is a 501(c)(3), donations to RAMP would qualify as tax deductions, which they had not been previously, Mr. Hunter added. 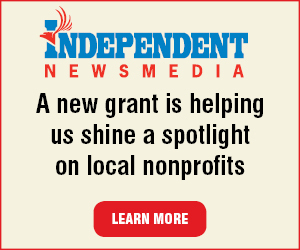 “We do several property clean-ups through RAMP each month, and could do more with more funding; the need appears to be growing,” Mr. Hunter stated. Creating the foundation will ensure SCRAP will be there years from now when the walls need attention again, according to Mr. Hunter. The foundation will also will likely become the primary funding channel for RAMP activities, and could possibly expand its role in the future, he added. “Lloyd, Ritchie Miller and all the volunteers deserve great thanks for helping us keep our community beautiful,” Mr. Hunter stated. From a financial point of view, the biggest challenge for the wall project was how to be recognized so fundraising could happen, according to Mr. Miller. SCRAP officials began the effort with just $1,500. They started by putting signs beside the walls that were completed and there were some articles published in the Independent. “That helped, but surely wasn’t an answer to the need for substantial funds,” Mr. Miller stated. In addition to SCHOA, the wall project benefited from donations from seven different corporations, businesses and Sun City organizations, according to Mr. Maple. There were also donations from 304 individuals, he added. Mr. Maple talked to any groups that would listen and SCRAP did receive support from some of them and from some individuals. SCHOA also became a major funding source for the wall project, he added. 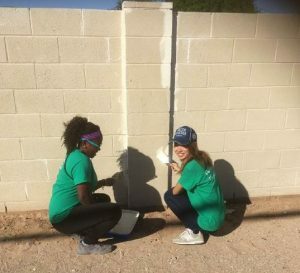 In addition to community volunteers, the Sun City wall project had some international help, including Shaniella Petra from the Solomon Islands and Rimi Kurosawa from Japan. There is a small amount of funding left over, which will be held by the SCHOA Foundation for the next time the walls need painted. Mr. Maple said in the 32 months it took to paint the walls there were 10 caulking and painting parties with 55 people participating. “We spent many hours trimming bushes, trees and the growth coming through the sections between the walls before they could be painted,” he stated. 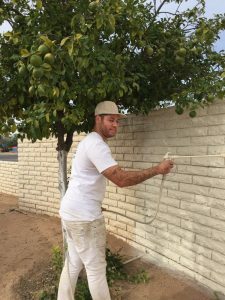 Of the 55 volunteers who did some painting over the length of the project, 23 were Sun City residents and 28 were from outside the community within the West Valley, according to Mr. Maple. There were also four international volunteers — two from Guam and one each from Japan and the Solomon Islands, he added. The project took 3,667 gallons of sealer and paint to cover more than 17 miles of walls. “I lost track of the number of tubes of caulk we used,” Mr. Maple stated. All the painted walls are now one color, with the primary walls in a color called Patience from Sherman Williams (SW7555) with the inserts painted Whole Wheat from Dunn Edwards (DE6124), according to Mr. Maple. “Previously there were six different insert colors,” he stated. Some of the challenges volunteers faced during the project included water coming under the walls in some places, mostly from plants inside the walls that needed or received a lot of watering. “This is bad the for long-term integrity of the walls,” Mr. Maple stated. There were also some sections where falling trees and vehicles damaged the walls. Some were repaired with the same blocks and others with different blocks, which left them with color and continuity that was not the same a surrounding walls, according to Mr. Maple.